"A master fire dancer who forges molten lava with the raw wild power of their magical kicks." 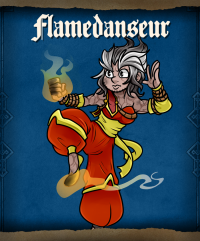 The Flamedanseur Class of URealms Live utilizes Dangerous Terrain in battle, and intense Fire Magic. Jeanie Jaredson was the character to be featured on the Flamedanseur's cards for Season 3. This page was last modified on 11 August 2018, at 15:45.